My newest modern crochet pattern is now available. 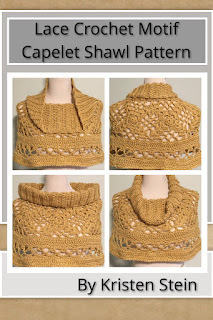 This one is for a beautiful and comfortable Capelet Shawl. It features delicate lace motif with decorative edging and ribbed collar. The neckline can be worn a number of ways: as a folded cowl, as a flat open cowl, or as a rolled boatneck. It’s a wonderful piece to layer over other items in the fall and winter to keep your neck and shoulders extra toasty. It can even be made without the ribbed collar if you want to use lightweight yarn and make a open+crochet, lacy shoulder wrap for spring and summer. This pattern uses 1-2 skeins of yarn (based on average skein sizes). It can be made in a few hours using basic stitches. Thanks for taking a look at my most recent ebook. Please see my other patterns currently available.